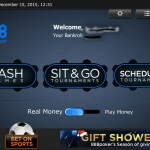 After thoroughly testing out the 888 Poker App over a period of two weeks, I can say that overall I am highly impressed by the features the app offers which include the ability to play cash games and tournaments right from your mobile phone or tablet. I highly recommend the 888 Poker App as it is among the top options for playing poker from your phone or mobile device, both real money and play money games can be used once you have created an account. The 888 Poker App supports Android and iOS meaning that most new Samsung phones as well as iPhones and iPads are supported the only downside is that there is no 888 Poker Windows App so many Nokia and Microsoft phones are left in the dark for the time being. The menu is simplistic and you can toggle between Standard Tournaments and Snap Poker via a tiny tab on the side of the screen. The 888 Casino and Bet on Sports features can be accessed at the bottom of the page. The Cashier, account details and App settings can be changed from the menus at the top of the page. We have previously reviewed the 888 Poker App, so if you would like to know more about the app’s features please read that post. I would like to move onto what can be improved in the 888 App. Win an 888 Poker FreePlay bonus worth $5 by playing the 888 FreePlay Frenzy tournament for a low buy-in of only 1¢. 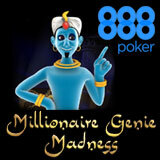 The top 10% of players registered for the 888 FreePlay Frenzy tournament will receive $5 freeplay to use on the 888casino Millionaire Genie slot game. 888casino have announced their luckiest games of 2014, the top three slots being: Millionaire Genie, A Nightmare on Elm Street and Ultimate Universe. Currently there are four 888 poker special tournaments where players can win freeplay bonuses, t-shirts, caps and a deck of 888poker playing cards. New players get a $8 free just for signing up, no deposit required, plus up to $88 in additional free poker bonuses from 888poker. There are also 888 Poker Live the Dream freeroll tournaments running daily this October, get free tournament tickets when signing up. 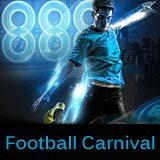 888 Poker Football Carnival kicks off with $4ook in freeroll tournaments running during the promotion. The promotion has a qualification period running from 2nd - 11th June with daily Warm Up Freerolls. The promotion also includes: free sportsbets, poker bonuses and daily free kick prizes where players can win tournament tickets, 888casino freeplay and branded merchandise. 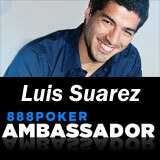 888 Poker recently signed Uruguayan football striker Luis Suarez as 888 Poker Ambassador to represent the brand globally. Luis Suarez 888 Poker Ambassador, the professional football player is a newly added representative for the 888poker brand. The Uruguay football legend was recently named 2014 Player of the Year and is currently preparing for the 2014 FIFA World Cup Brazil. Suarez enjoys playing poker and is eager to be part of upcoming promotions when he gets a break from his busy football schedule. The list of 888poker Ambassadors now includes: Luis Suarez, Shane Warne, Georges St-Pierre, JC Tran, Sofia Lovgren and Xuan Liu. 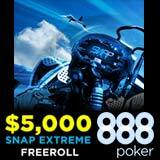 Something EPIC has been announced by 888poker, the new promotion includes two daily $5,000 Snap Extreme Freerolls on 888poker plus a chance to win a Fighter Jet Flight Package. The Fighter Jet Flight Package consists of travel and accommodation to the Czech Republic for a once-in-a-lifetime flight in a L-39 Albatross fighter jet. The 888Poker Snap Poker promotion offers more than $250k in freeroll prizes pools plus the top 600 players will also qualify for the weekly Jet Fighter Flight Freeroll. All players are given two free tournament tickets for the $5,000 Snap Extreme Freerolls, players can earn additional tickets by completing the daily challenge on the SNAP poker tables. The 888 Poker Snap promotion starts from 24th April and runs until the 21st May, 2014. New players than sign-up get free tournament tickets and up to $88 free, no deposit poker bonus.